Large comfortable bed, soft luxurious pillows. Excellent shower. Extremely good value for the price Would stop here again for any future Perigeuex visits. Basic but very good, just what we wanted for our very brief stay and a surprisingly good breakfast. The bed was comfortable. The water was hot. Generous breakfast with a nice choice of food. Location was suitable to my needs. Great location, a short walk from the old town. Friendly helpful staff. Excellent parking provision at the rear of the property, saved paying for on-street parking. Comfy but basic! Very good location for the town with parking at the rear. Good value. 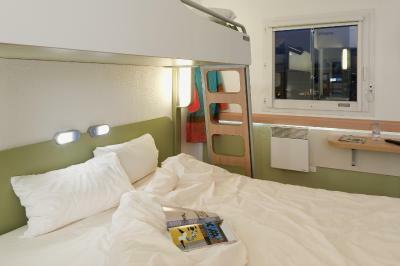 Really comfortable bed in a small functional bedroom. Room basic but clean. Great location. Great breakfast! It’s close to the centre. Shower was good. Receptionists very friendly and helpful. AC worked well. 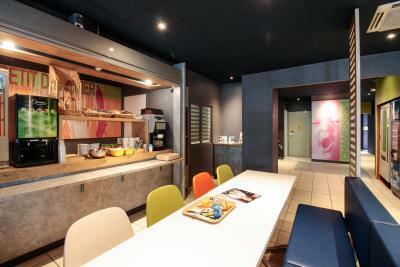 Very close to the centre of town, comfortable bed, good breakfast & helpful staff. 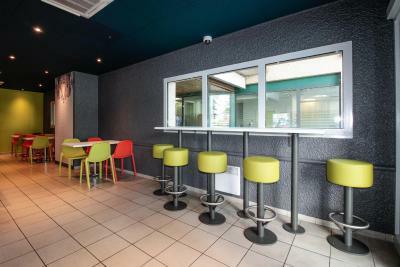 Location in the town centre that was ideal for our purposes. 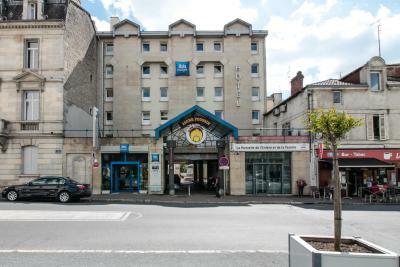 This ibis budget hotel is located 2,300 feet from Périgueux’s historic center, cathedral and train station. 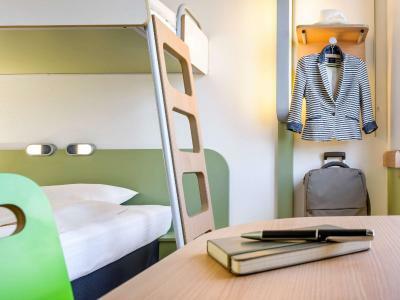 It offers a 24-hour reception, free Wi-Fi access and air-conditioned rooms. 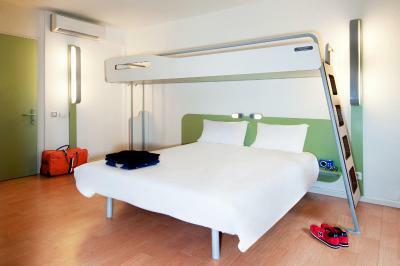 The rooms are decorated in a contemporary style and include a flat-screen TV. Each one is also complete with an private bathroom. 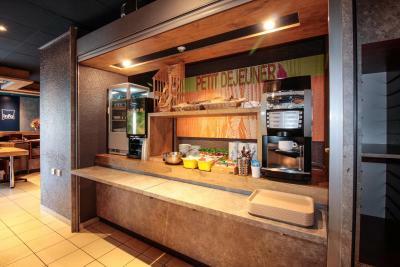 After enjoying the buffet breakfast in the dining room, you may choose to drive the 3.1 mi to Périgueux Golf Course. 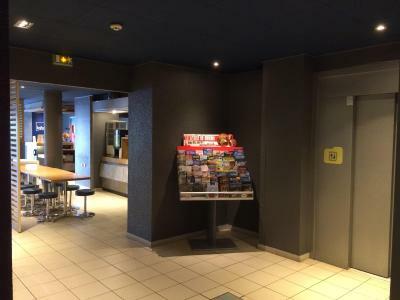 Private parking is available with an extra cost and Périgueux-Bassillac Airport is 6.2 mi away. 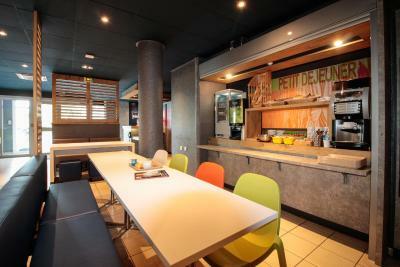 When would you like to stay at Ibis budget Périgueux? 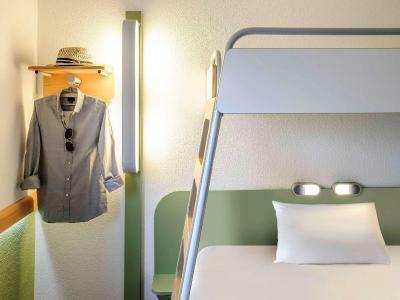 House Rules Ibis budget Périgueux takes special requests – add in the next step! 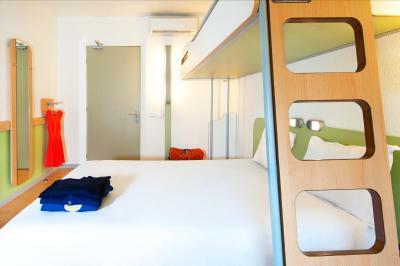 Ibis budget Périgueux accepts these cards and reserves the right to temporarily hold an amount prior to arrival. Looked very “tired”. Quilt cover on bed was clean but looked as though not ironed! Bathrooms were run-down, rooms small. Tiny very plain room, with no tea/coffee making facilities. No shower gel. Nowhere to park the car. Breakfast not very good - awful coffee. Very out-of-date. Very expensive compared to comparable accommodation. Air conditioner was absolutely filthy with black mould inside the vents!!! I requested a quiet room but instead I was next to a room which had people in and out of the room, opening and closing the door (loudly) until almost midnight. There was difficulty with the WiFi connectivity. Good location ( city center ). Room very comfy and clean. Very quiet zone. The staff is very kind and nice. Very pleasant staff, good location. The room we were initially given was dark and smelt of cigarettes, despite this being a non smoking hotel. There was a flat roof outside the window that was littered with empty beer cans and food, all standing in rain water. Thankfully, we were able to move to a room on the second floor which was much better. 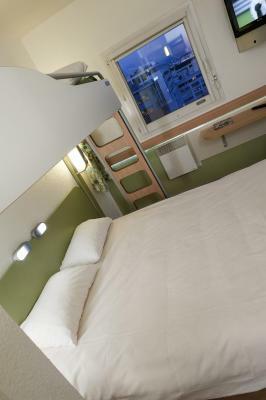 I liked the clean basic accomodation.